Liverpool is best known as the scruffy British industrial city that gave the Beatles their start back in the 60s, but it is recognized today for reinventing its image as a home to an expanding biotech presence. SAFC and Sartorius Stedim Biotech’s recent “Downstream Processing Day” seminar was held in the city and brought together investigators from a number of companies, many with facilities at the Liverpool Science Park. Purification issues are critical to the development of high-quality vaccine proteins. François Champluvier, Ph.D., a research scientist in downstream industrialization at GlaxoSmithKline, presented his investigations on removal of host-cell proteins during vaccine purification. The standard purification protocol is based on anion-exchange chromatography followed by cation-exchange chromatography and a final step using hydroxyapatite. “Our challenge was to achieve a lower final host-cell protein content, but with minimum modification to the existing process and without impacting the process overall yield,” Dr. Champluvier explained. Since the purification process uses Sartorius Stedim Biotech membranes, it was necessary to work closely with the company in order to arrive at an optimal solution. The Sartobind membranes are composed of chemically modified cellulose—Q being a strong anion, S a strong cation, and HIC a phenyl ligand. The approach that Dr. Champluvier and his colleagues adopted was to perform prospective evaluations at a small scale with different filters to identify the optimal conditions, then include these conditions in the existing process. The small-scale trials revealed that the Sartobind S filters provided the best combination of recovery of protein while maximizing host-cell protein elimination. Estimates of viral contamination during bioreactor runs at production scale range from 1 in 360 to 1 in 500, making such events quite unlikely. But because of their high impact, their consequences are extremely grave, as discussed by Clare Medlow, technical manager at SAFC. Moreover, few after-the-fact troubleshooting investigations are successful, given that it is difficult to identify the root cause and source of the virus. Thus, one strategy is to install broad preventive measures, removing the components that present the highest risk. There are a number of mechanisms by which a production train can become contaminated including the cell line itself, the compressed gases that buffer the medium, the water, and the components added to the medium. Of these possibilities, the feeds and additions to the medium may be the most likely, given the many sources involved and the fact that many are of animal origin. In many instances, multiple layers of security must be applied including irradiation of solutions, pasteurization, removal of animal products from the formulations, and screening for viruses. All of these can mitigate against contamination at various point in the process. Viral inactivation of solutions through a pasteurization process can be used on material that does not contain serum. Precise control of temperature and residence times in the heating vessels are required. Medlow described two types of high-temperature, short-time liquid treatment options. The first is the shell-and-tube heat-exchange system from Cotter Brothers/GEA Processing Engineering, consisting of several tubes encased in a larger tube. The other device is the Actini Electric Actijoule®, in which application of a low-voltage current to a steel tube heats the liquid inside the tube. According to Medlow, 4–6 logs of virus reduction can be achieved under specific pilot conditions and then evaluated at expanded scale. Steven J. Burton, Ph.D., CEO of ProMetic Biosciences, considered the use of mimetic ligands in the purification of biotherapeutic proteins. These synthetic ligands, obtained through the use of computational chemistry, are tough and can be reused for many purification cycles. Because they are made through conventional chemistry rather than by biological systems, there is no risk of contamination, and they are economical to manufacture compared to ligands from traditional biological sources such as protein A. Active ligands can be generated through modeling and optimizing existing ligands, referred to as analogue synthesis. In this case the active site is known, simplifying the modeling of the complementary ligand structures—a process referred to as rational design. However, in some cases, neither the active site nor ligand is known, necessitating a systematic screening using ligand arrays. ProMetic scientists have developed an approach to improve their synthetic ligands. This method is referred to as molecular docking, in which they prioritize ligands by a virtual screening strategy. By developing algorithms that place a ligand into a binding site and then score the resulting pose, the candidate molecules can be ranked. Those that would be disallowed for an immobilized ligand can be removed from further consideration. Such an approach saves time and resources since it allows the scientists designing the ligand to avoid fruitless and unproductive molecules. As a successful application of the rational design strategy, Dr. Burton described his company’s development of synthetic affinity ligands in which x-ray crystallographic data for transferrin was analyzed using the ConSurf Server program, which identifies conserved and variable residues. ProMetic Biosciences has developed a way to improve synthetic ligands in which it prioritizes ligands by a virtual screening strategy. The company says this approach saves time and resources since it allows for fruitless and unproductive molecules to be avoided during ligand design. A move away from serum-based cell culture media is occurring in the protein therapeutics arena, as evidenced by the fact that no new serum-based processes will be accepted by the industry, according to Hikmat Bushnaq-Josting, technical manager for SAFC in Europe. Today, suspension culture is recognized for the number of virtues that it displays when compared to two-dimensional, adherent culture systems. Trypsinization is not required for harvest, the systems are more homogeneous, it is easier to sample and transfer, and it is much easier to develop processes for suspension cultures and scale them up. The downside, however, is that the behavior of cells grown adherently is more natural and the reaction kinetics between virus and host cell are faster and more efficient. Still, the benefits are tending to move the industry in the direction of suspension cultures. The classic cell lines, such as MDCK, Vero, and HeLa, were not developed for bioproduction, so Bushnaq-Josting’s recommendations are that labs should ease into adoption of this changing picture. “It is also important to develop flexible facilities that can be adapted to different vaccines reflecting the particular pandemic for which the vaccines are being developed,” Bushnaq-Josting added. This consideration sets vaccine technology somewhat apart from other protein-based therapeutics, in that the logistic requirements of the latter are somewhat more predictable. In discussing strategies to minimize cost and maximize flexibility, Bushnaq-Josting suggested that manufacturers of therapeutic proteins should outsource media and buffer manufacturing during the clinical phases of a program until a monthly consumption of ca. 10,000 L is reached. Also noted is a move toward more and more outsourcing of the liquid products preparation, while at the same time trending away from total customization to a more standard packaging format. These approaches will drive stronger partnerships between liquid manufacturers and vaccine manufacturers to be prepared for pandemic situations and overcome a potential capacity crunch. 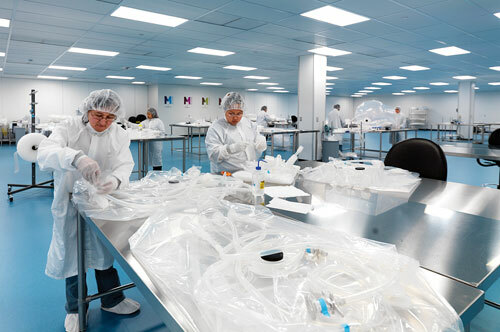 Sartorius Stedim Biotech has made major inroads into the disposable products sector in recent years. This decision has had a positive effect on the company’s bottom line, given that the world-wide economic downturn has held back many firms both in and out of the biotechnology area from making major investments in capital equipment. According to Dean, these products are composed of four layers of different materials to provide a secure holding technology. This includes a straightforward scaleup operation from 5 L up to 3,000 L using the same S40 film and 3-D bag technology. At all volumes these features endow the products with high robustness and reliability, and the 3,000 L volume moves the disposables into the range previously occupied solely by reusable processing equipment. The disposable technology can now provide rapid deployment of complete single-use engineered liquid handling and storage through a range of accessories, a validation package, and a global security strategy, she said. K. John Morrow Jr., Ph.D. (kjohnmorrowjr@insightbb.com), is the author of Epigenomics: Future Applications in Therapeutics and Diagnostics by Kalorama Information, is president of Newport Biotech, and a contributing editor for GEN.